L12, a more modern design used for most new construction at 400 kV and 275 kV. Most of the calculations on this web site are for the L12 design. The following figure defines the dimensions. For an explanation of the different parts of a power line see here. Values are entered in this table to the same resolution as in the underlying data we use in National Grid for our own calculations. In some cases these will have been converted from imperial units and the amount of rounding may be variable. The table gives the dimensions relative to the centre of the tower at the level of the bottom phase conductors. All normal UK towers are symmetrical about the centre line. Dimensions are to the "bottom centre" of the conductor bundle - the horiziontal midpoint at the level of the lowest conductor - not to the end of the crossarm - on tension towers with a horizontal insulator it's the same thing, but on suspension towers the conductor hangs from a vertical insulator below the end of the crossarm. The table gives the commonest conductor bundles used on these towers. But many other variants are used as well, with larger spacings or different size conductors. Earth wires are sometimes smaller than the phase conductors. Bundles of 2 conductors ("twin") are horizontal, bundles of 4 ("quad") form a square. The conductor bundle has no effect on the magnetic field, which simply depends on where the current flows, not what it flows in. But it does affect the electric field. More on the effect of the conductor bundle here. The positions of the conductors relative to each other stays the same throughout the length of the line, but the clearance above ground varies from span to span and along each span as the conductors sag. 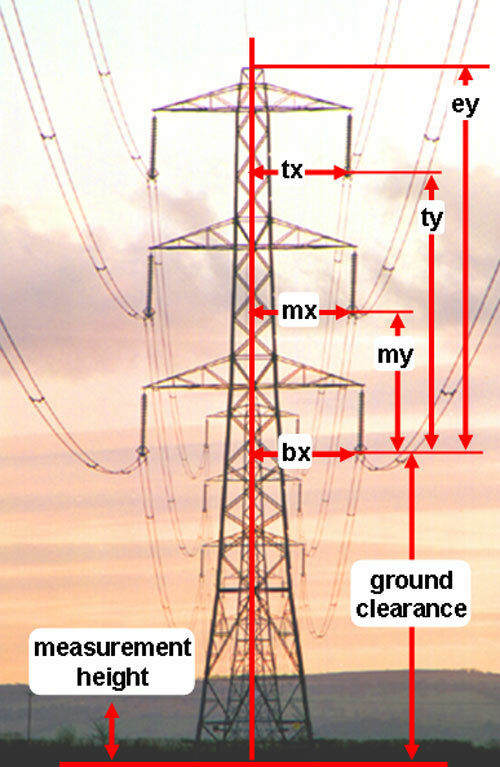 The minimum clearance to ground for 400 kV is 7.6 m but is rarely found in practice. When we want a typical clearance we often use 12 m. If there are buildings nearby the clearance is likely to be even higher, and the clearance is clearly higher at the towers than in the middle of a span. More on the effect of ground clearance on the field. We usually calculate fields at 1 m above ground level for reasons explained here. Several different manufacturers built L6 lines and the dimensions varied subtly, and there is a variant of the L2 where the middle crossarms are wider. Also, where lines go round corners, the towers are designed to keep the horizontal spacing of the two circuits the same, but nonetheless the spacing can vary slightly at corners. If you have questions about these data, or you'd like us to provide dimensions for a further different design, please contact us.